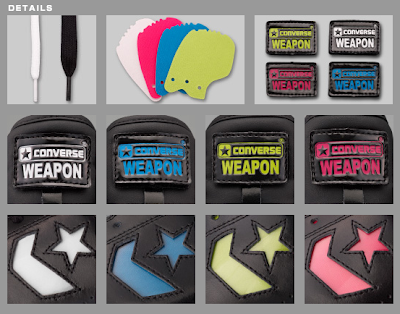 Good Wednesday World, and welcome to the latest edition of The Converse Blog's Weapon Wednesday. 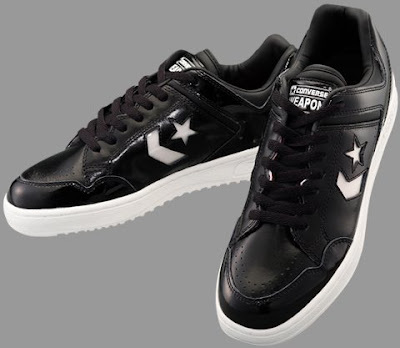 Today's Weapon comes from Converse Japan, who has been killing it with their Converse 100th year celebration. They've really taken full advantage of the limitless possibilities of the world wide interweb. One of the really interesting things they've done this year is go back and reinterpret some earlier releases. Like this particular Weapon is based on a 2003 release of the classic shoe. What you can't tell from these pics is that these Weapons work like a Cheerleading shoe. They come with color inserts that go where the chevron and star is located. They also have inserts to replace the tongue logo. You can get a better idea of what I am talking about below. So long for today, thanks for stopping in don't forget to vote today is the last day for this poll. Aside from the soul, they're great. That's a really cool idea. I wish it came in Hi. Japan always seems to go with the Oxes. I live in Osaka, any idea what store(s) these are at?